La note a été taggée Floppy, Pippin. 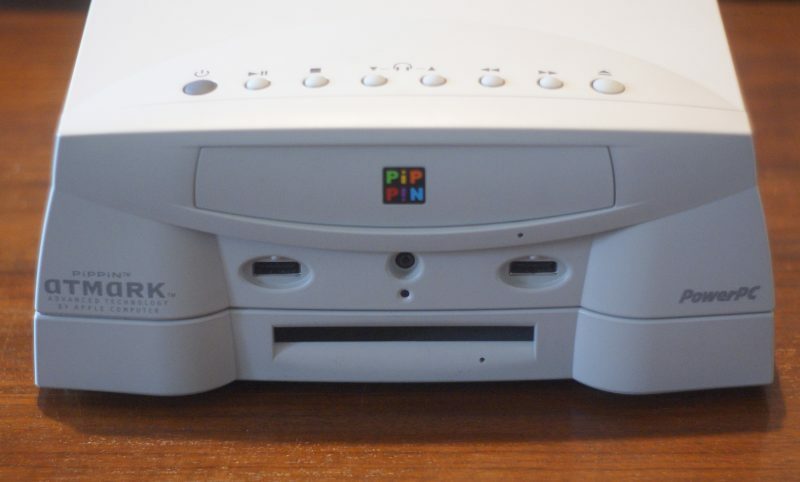 In the accessories of the Bandai Pippin, the Apple console, the floppy drive remains rather rare. A French reader who had one loaned it to me for a test on this blog. I took the opportunity to clone the card. The floppy drive in question, which is optional in Japan (and not released in the United States), is to be placed under the console and read the 3.5-inch disks of 1.44 MB. Flat enough, it fits perfectly under the console: the feet are stuck in a support and a clip on the back fixes it all. The drive passes through the extension slot under the console, protected by a cache. 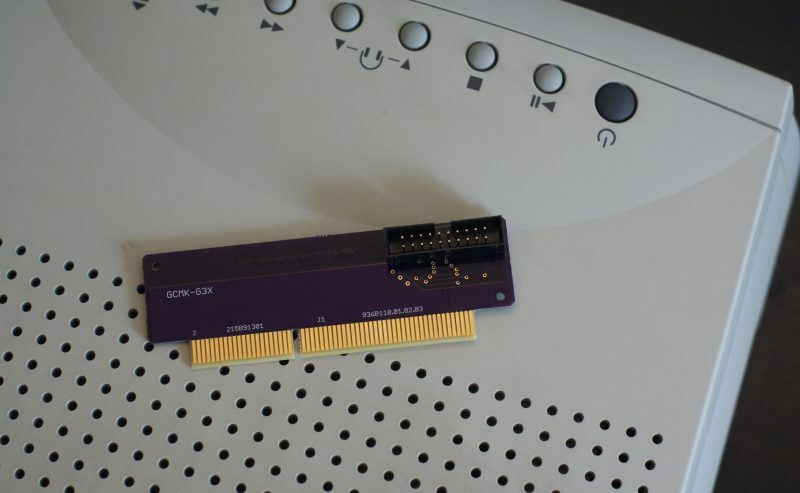 On the player side, there is a male connector, similar to that of a PCI card. On the console side, there is obviously a female connector. Internally, it’s pretty empty: a classic Apple floppy drive with its 20-pin connector and a small passive PCB. 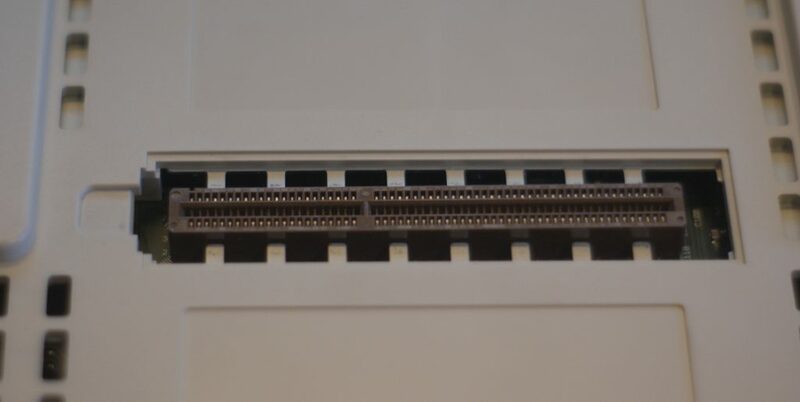 Actually, the console contains the controller and the connector is only used to transfer the signals. 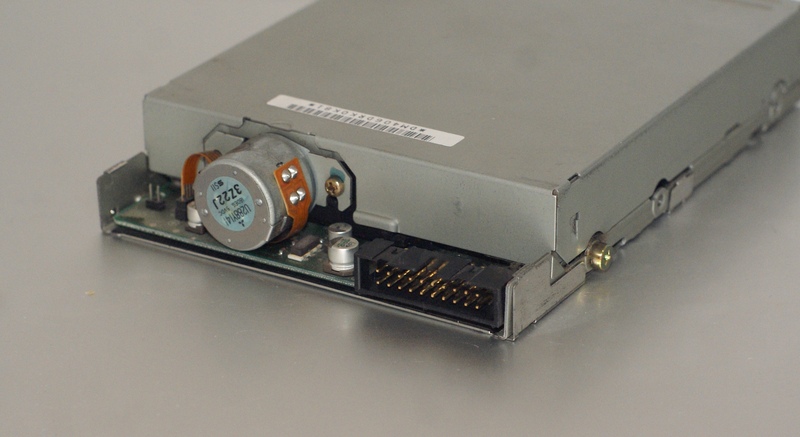 It is also used in the same way for PCI or SCSI adapters. The floppy drive does not have an eject button, the games themselves have to handle this point cleanly. We still find a hole for a trombone. I do not know the exact list of games compatible with the floppy drive: this is usually mentioned on the box but I only own a few. So I tried empirically some tests: run a game and check if it was running the drive or if it offered backup options. Here are some examples with screenshots. Thing to know is that Pippin games only understands the HFS, Apple’s old file system. Officially, Sierra cannot even read it any longer (in practice, it’s fine) and it is obviously impossible to write on a floppy disk without going through an old OS (Leopard at worst). The Pippin handles the 1.44MB floppy disks without any problems, so any USB floppy drive should be enough to retrieve the contents of the floppy disks. 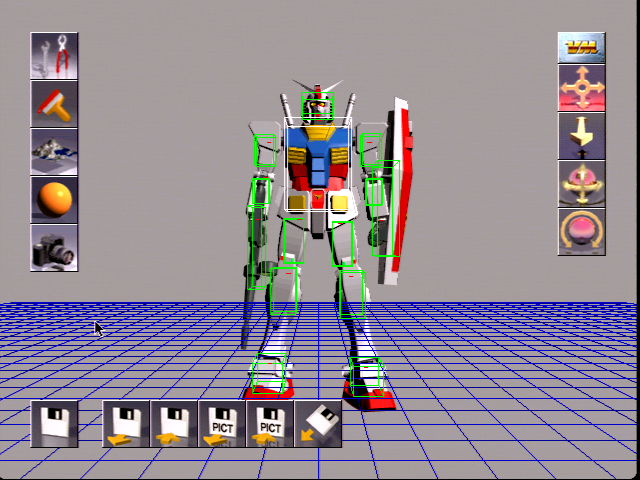 In this “game”, you can literally build a Gundam. The render takes a little time (like, several minutes) and the program supports the floppy disk drive but also the MO drive of the console. It saves the images as a file for the program itself or as PICT images (the format of the Macs of the time). Be careful to eject the floppy disk from the program. 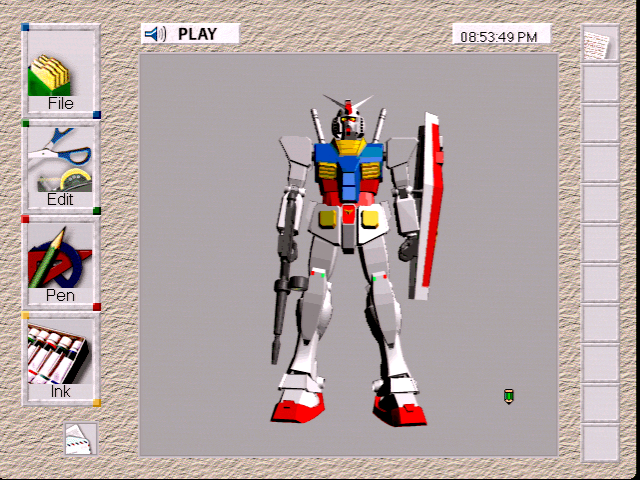 Racing Days is quite peculiar: it allows to customize your vehicle with a small editor that resembles MS Paint and save everything on the diskette. The reloading of the data is a bit special, especially if you have drawn on the original Racing GT R. In theory, you have to put the floppy disk on, change the car and go back to the one that has been modified. In practice, perhaps because I do not use the original CD, it crashes the game every time. Silly bonus, it does not eject the floppy disk. The Japanese version of TV Works (2.1), as well as the American version (3.0) supports the floppy drive. It is possible to save the images and text on it. I advise you to quit the program properly to eject the floppy disk to be sure to write correctly on it. Both versions offer direct compatibility and open the same files (although encoding can cause problems with the Japanese version). TV Works can even open PICT images saved by other softwares. 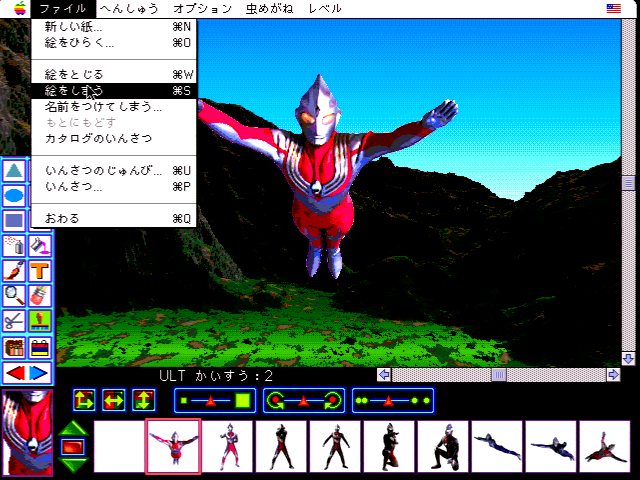 This “game” consists in putting up pretty images of Ultraman, a Bandai hero. It allows to save on the floppy disk, in proprietary format or in PICT format. It offers “Mac OS” menus that allow you to easily understand commands with shortcuts (convenient). 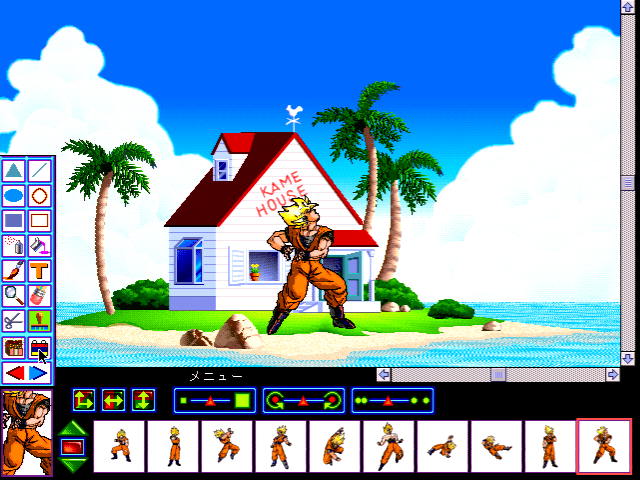 The same program with images of Dragon Ball Z and less menus. The interface is in Japanese on the Pippin (rather oddly, it passes in English on a Mac) and offers the same data backup functions. It is also possible to print. 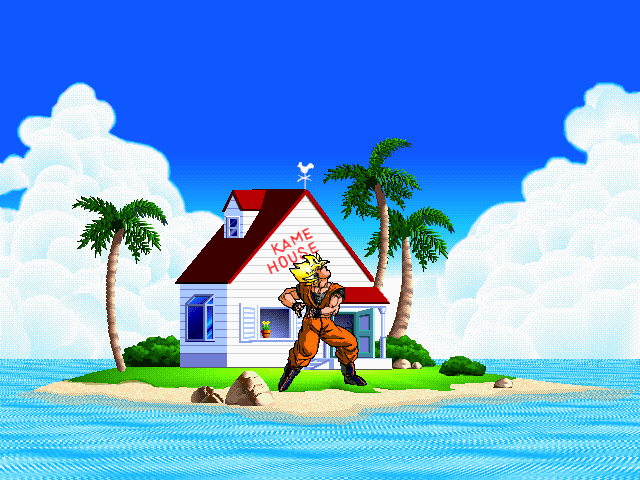 The game is saved with Japanese characters, so it ends with a bizarre result with a Mac OS in English or French. 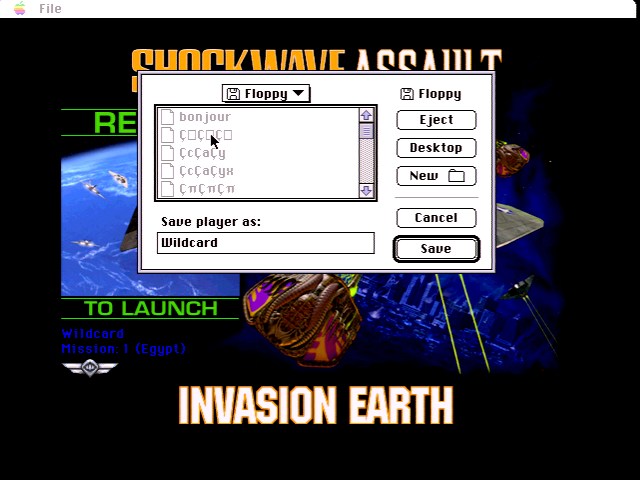 Shockwave saves the player and his data on a floppy disk and allows to retrieve the data from another device (Pippin or Mac). Of course, some games do not take advantage of the floppy drive. Others do … maybe. Dazzeloids obviously accesses (well, audibly) but I do not understand anything about this game and a game on Mr. Potato has created a folder on the floppy disk. In the other games, I did not notice any access, but I tested pretty fast and I do not have all the games. Pease, which I already mentioned, is a software for Pippin that allows to launch other softwares. A kind of alternative to the Finder for the console, with an interface capable of listing software. By copying a program (or game) on a floppy disk, it becomes possible to launch it from the Pippin through Pease. It is frankly slow but it works. I first tried it with Indiana Jones 3, but could not run it: Pease only displays 256 colors, the game requires 16 to the maximum. With Prince of Persia, on the other hand, it works: Pease sees the game, it is possible to launch it, to play (with an ADB keyboard), etc. 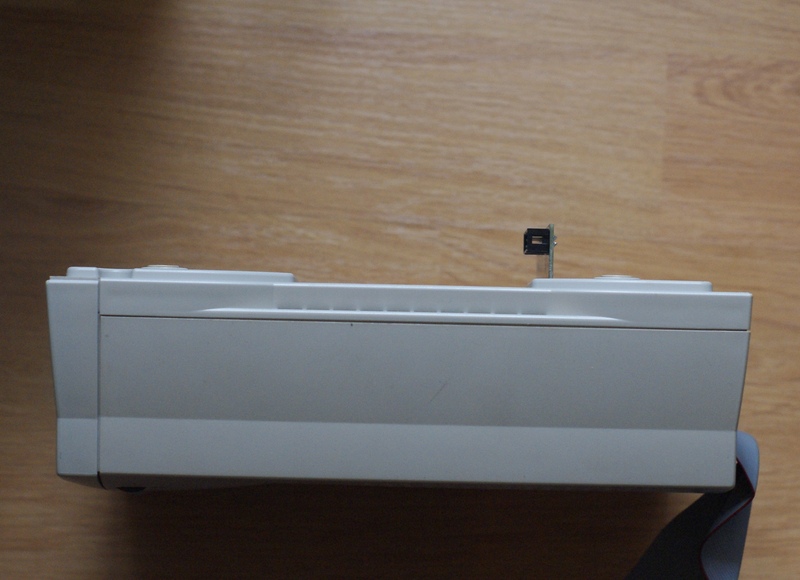 As explained above, the assembling is fairly simple: an Apple floppy drive with its 20-pin connector and a small PCB with the connector to be placed under the Pippin on one side and a female 20-pin connector on the other. After having taken some photos, checked the pinout and measured the components, my colleague designed a small PCB, reproducing the original. I won’t bother you with the details on the design, but the PCB is available on OSH Park. For the first test, I placed it under the console and plugged in my Floppy Emu, a virtual floppy drive. This small device, sold a hundred dollars (it’s quite expensive) emulates an entire Apple floppy drive and allows to put disk images on a microSD card. 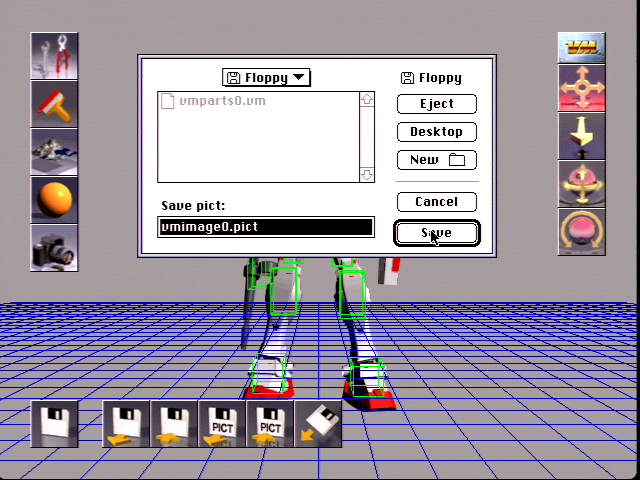 Once connected to the Pippin, no problem: the Mac OS CD sees the player, just like the few games compatible with the floppy disks. If you are on macOS Sierra, I advise you to download empty images and use that of 1.44 MB. Beware, macOS Sierra does not write anymore on the HFS for the moment and the images of the disks are to be read only since a recent Mac. The Pippin can save data on them to retrieve them on a modern device, but it is not possible to directly write on the disk images. I had a little more trouble with a real floppy drive. First, we had to find a compatible reader in my lab, between the 800 kB drive and the defective drive. Then, oddly enough, not all floppy disks are working. More precisely, some are readable but marked read-only by Mac OS (and Pippin games) while others allow to write without any problem. I checked on a recent Mac and in both cases, the floppies seem to be formatted in classic HFS, with no visible differences. I have absolutely no idea of ​​the source of this problem. However, with an “HD” disk formatted properly in HFS, the adapter works. Afterwards, the adapter was designed with the purpose of using the Floppy Emu for its practical skills, then a few erratic operations with a physical drive is not a concern. I will try to test with the original reader to check if the problem also exists with it: perhaps it comes from the Pippin. The main drawback is that the console’s extension slot is placed underneath the console. 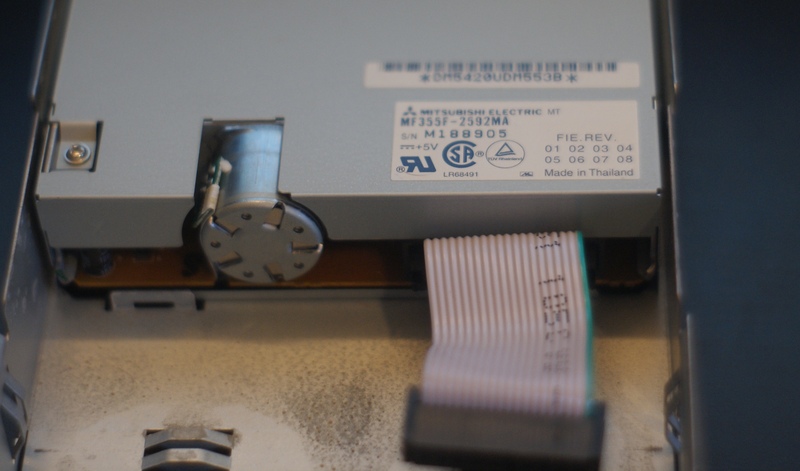 It is therefore necessary to raise it to connect a floppy drive, as with the original one. 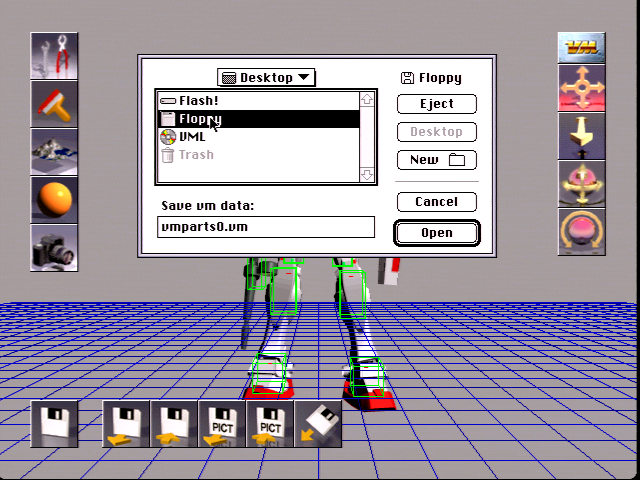 But I will try to develop a support to print in 3D to easily integrate a 3.5 inches floppy drive (or the Floppy Emu). For the moment, for an occasional use, it is not very annoying. UAn interesting accessory for the console, which allows to share some data (at least at that time). Remains the problem of compatibility and some bugs.